George Evans once said, “Every student can learn, just not on the same day, or the same way.” Similarly, the apostle Paul compared people with our body that has many parts; some people have different skills, but each one is complementary to the others (1 Corinthians 12:12-31; Romans 12:4-8). Christian teachers have an obligation to adjust our teaching to serve each individual student, and that requires using a variety of teaching techniques. As a language teacher, I try to use creative techniques to teach language. One technique I have found very effective for teaching those beginning to learn English is “Lighting the Matches.” It can be done outdoors for safety reasons if preferred. The goal of this activity is to bring fluency and encourage students to speak. To do this activity, a student lights a match stick and starts to speak. They have to speak as many sentences as they can before the fire dies. Then the next student does the same with a new match stick. During the first round, a student may say two to three simple sentences. For the second round, they rehearse mentally in order to be faster, and they improve. By the third round, their improvement is amazing. They improve because they are enjoying the learning experience and challenging themselves to do better. When students come into an English language class as beginners, they are often shy, nervous, and afraid to speak in English, but this technique can help them overcome this fear. 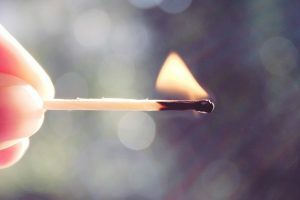 “Lighting the Matches” is also a technique that allows a natural avenue for integrating Christian faith. You can talk with students about the Bible verses that talk about light. For example, you might note that John 8:12 says, “I am the light of the world. Whoever follows me will never walk in darkness, but will have the light of life.” Jesus demonstrated in His life the best way to live. It isn’t enough just to know that Christ is light. We must stay close beside him and follow His leading every day of our lives. Christ is able to bring comfort and guidance to people who find themselves stumbling in spiritual darkness. We must listen to His word. Psalm 119: 105 says, “Your word is lamp to my feet and a light for my path.” With this assurance “Let us walk in the light of the Lord” (Isaiah 2:5). You can point out that Jesus not only gives us light, but calls us to be the light of the world: “Let your light so shine before men, that they may see your good works and glorify your Father in heaven” (Matthew 5:16). This is a reminder that all of us, teachers and students alike, could benefit from. Prity Pearly Bairagee, Ed.D. MA English, is currently serving as an Associate Professor and Dean of the Humanities Department at Adventist University Zurcher in Madagascar. She has taught English Language in elementary and secondary schools, and served as Office Management and Education Department Chairperson in Bangladesh Adventist Seminary and College.